It is essential for both the doctor and the patient to work toward the same objective when utilizing Non-Surgical Spinal Decompression Therapy. 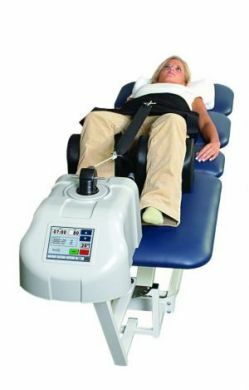 Spinal Decompression Therapy has a goal; and it is important that each patient understand both the objective and method that will be used to attain this goal. This will prevent any confusion and give clear expectations for the patient. Non-Surgical Spinal Decompression Therapy produces the forces and positions required to cause decompression of the intervertebral discs. Decompression is the unloading due to distraction and positioning of the spine. This therapy produces negative pressure within the disc to allow the particular injury to heal naturally. Conditions that may be treated include: back pain, neck pain, herniated discs, protruding discs, degenerative disc disease, posterior facet syndrome and sciatica. Patients are treated fully clothed and are fitted with a pelvic harness that fits around their pelvis as well as a thoracic harness as they lie face down, or face up on a computer controlled table. The doctor operates the table from a computerized console, where a customized treatment protocol is entered into the computer. Each treatment takes about 20-30 minutes. The average treatment protocol is approximately 20 to 28 treatments within a five to seven week period of time, depending on the individual's case. The therapy may also include electric stimulation, ultrasound, thermotherapy (heat), and cryotherapy (cold) before, during, and/or after the treatment. Your doctor will use these therapies when appropriate. All of the above aid to accelerate the healing process. Although there is no procedure that is 100% successful, non-surgical spinal decompression therapy has a high success rate with full compliance on the part of the patient. Your doctor will recommend that you refrain from certain activities and that you engage in a certain rehabilitation program either during or after your therapy. If you adhere to your prescribed therapy, you will enhance your chances of success. Drinking at least a half-gallon of water per day will enhance the re-hydration process within the discs. Your physician will also recommend some nutritional supplements that will aid in the healing process. Cessation of smoking is imperative.